I Love You But I've Chosen Techno, House, Dubstep, Electro & Trance T-Shirts, Tank-Tops, V-Necks, Hoodies & Apparel. 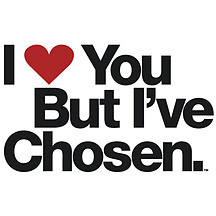 I ♥ You But I've Chosen. It isn't just a bold statement in bold Helvetica typeface. It’s the feeling you get when you are so passionate about something that if given a choice, you would choose that one thing over anything else. That's what it means and this is the story behind it. It all started with a party. Our background is in producing quality electronic music events in the nightclubs and underground warehouses of the mean streets of Detroit, the birthplace of Techno. In March of 2010 we were working with a talent agency, putting together a huge Techno afterparty for Detroit's three day electronic music festival, Movement. Struggling to come up with a name for the event, we were going back and forth with the agency for weeks and just couldn't agree on one we all liked. Finally, three days before the event was to be announced the name emerged: I ♥ You But I've Chosen Techno. It was the perfect name and we all loved it. So what does this have to do with an apparel line, you ask? Well, as promoters we had been printing T-Shirts to market our event production company for years. We'd sell them at our events and also at vending booths at Detroit's Movement festival. In early May of 2010, we were hatching a plan to sell 400 T-Shirts at our festival vending booth: four designs, a hundred of each. We had three designs ready to go but we still needed a fourth. Due to either designer's block or a lack of time, we decided to use the I ♥ You But I've Chosen Techno logo that we created for the event flyer as our fourth T-Shirt design. Fast forward to Memorial Day weekend and day one of Movement. To our surprise, we sold all 100 of them within the first few hours of the festival and had at least 500 more people who attempted to buy one over the next three days after we had sold out! We knew we were on to something. After the festival we printed more shirts, adding different style and color choices while we continued to sell them at our events and various other festivals around the country. We sold around 1000 T-Shirts the following year at our Movement festival booth and began selling them online. The following month we became sponsors of the 2011 Identity Festival Tour and traveled to 20 cities across the USA, selling our apparel. We began getting requests for other genres of music but were hesitant at first because although we appreciate music of all kinds, our main thing is Techno. After a lot of thought we decided to give the people what they want and expanded into other genres. While on tour, we added the three most requested genres: House, Dubstep and Electro to our line. People were stoked but were still asking for more. After the tour ended we added Trance to our line. We dropped Techno from our brand name since we were no longer just selling Techno apparel and I ♥ You But I've Chosen was born. We'll be adding more genres and styles to our line as time goes on and we will definitely be traveling to more festivals worldwide. When you see us in your town, be sure to come say hello and if you feel the urge, buy a shirt. Selling them and putting smiles on people's faces is kind of our thing. Techno, House, Dubstep, Electro & Trance T-Shirts, Tank-Tops, V-Necks, Hoodies & Apparel.